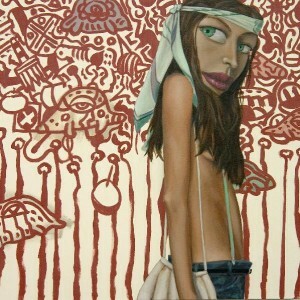 In Dickson Schneider‘s fashion series paintings, he uses models that are placed in the fine arts contexts such as in the art gallery or museum setting. In this painting entitled “Heroin”, a super-model drifts past an imaginary Keith Haring painting while showing off her beautiful handbag. The title connotes and references Keith Haring’s infamous drug addiction, while the painting creates a deliberate dissonance between the real/unreal and desire/humor. The Paolo Mejia Art Gallery and Design Studio is proud to endorse Frost Newton, one of our in-house artist that we represent. 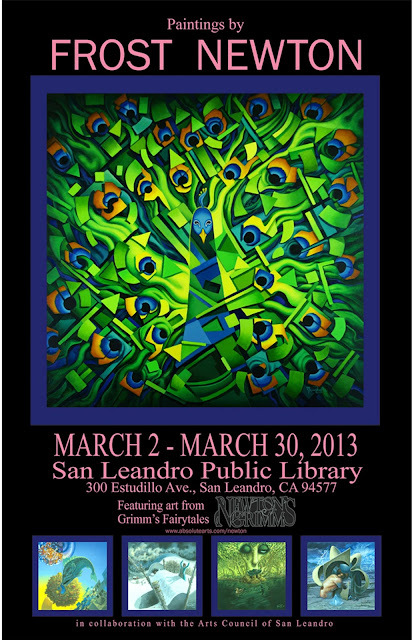 He will be having a solo-show at the San Leandro Public Library this March, and will be showing a body of work that will feature stories from the “Grimm’s Fairy Tales”. Come visit and see his original interpretation of the “Grimm’s Fairy Tales”. Frost Newton’s artwork are for sale and can be also viewed at www.paolomejia.com. For inquiries contact us at paolomejia@hotmail.com or visit us at our on-site gallery at the Paolo Mejia Art Gallery and Design Studio in San Francisco, California. 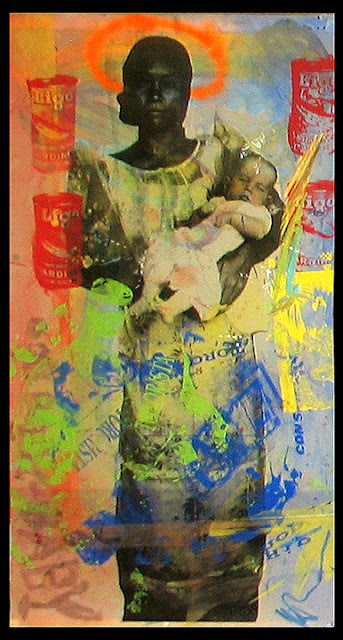 Mel Vera Cruz’s artwork references a neo-pop and neo-expressionist style that evokes social commentary on today’s experiences in society. The art show is entitled “Quintessential Adobo“. 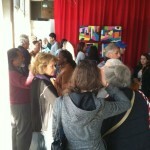 The art show is about the suggestive labeling and pigeon-holing of groups and people. In this art show, Mel Vera Cruz exhibits his art and what he experienced as an immigrant. Mel Vera Cruz was born in 1964 Manila, Philippines. He had two major migrations. His first migration was from the province of Quezon to the city of Manila, and his second migration was from Manila to the San Francisco Bay Area. These two major migrations had a profound effect on him. As an effect of his emigration, he experienced discrimination and psychological displacement. Discrimination and psychological displacement were generally common experiences for emigrants. Mel had an ideal experience as a child because he spent it in the country where nature was his playground, but at the same time was a victim of discrimination early in life because of his provincial/rural background. However, his experiences fueled his desire to create. Mel’s attempt to exorcise his demons affected his art making process. This attempt of exorcism had a positive reaction from a negative situation. For Mel, this was the only way to take the baggage out of his system. Just as he was beginning to adjust to the cosmopolitan life of Manila, he migrated to the Bay Area in California where he was labeled ‘fresh off the boat’ or FOB. This was another experience that displaced him further mentally and psychologically. However, Mel had one advantage on his side and that was using the esoteric power of art as a tool to confront his disadvantages. Not all his experiences were bad, and this reflects on his art making process and artworks. In Mel’s works, you can feel the spontaneity and joy in his creations. It is like a release of synergy that came from his overall vibe and experience. Mel’s artworks illuminate in a chaotic but fun way. He has been interested in utilizing available materials or found objects because he likes to be self-sufficient, not only physically and mentally, but also spiritually. His surroundings definitely impacts his process and art making. Like a chemist, he can transform materials from his surroundings and then make them into pieces of art, because he believes it is integrated with his life and not separate or detached. Mel Vera Cruz overall believes in the freedom and independence in art making. This particular art piece is part of a series called Convolution. It conveys several themes. One theme deals with the idea of Industrialism creating materialism. Globalism is the product of Industrialism, and Globalism creates Capitalism, then Capitalism creating consumerism, which ultimately creates the idea of materialism. So, the piece conveys materialism being the ultimate production of Industrialism. The materialism concept is shown by the imagery within the collage patterned pieces. Consumerism is the product of globalism which makes us materialistic, because of what is induced on us by society everyday and over time. Another theme is the idea of binary opposition. Binary opposition is an anthropological concept that deals with existence of opposites — an idea that complements itself, like in Buddhist belief, the idea of binary opposition exists. Positive needs negative to exist. Therefore, it becomes balanced. In this visual piece, the achromatic colors of black and white is utilized. It connotes the idea of binary opposition. Another example of binary opposition that I come to use is the idea of attempting to make things simplified but ultimately becoming complex. It becomes complex as I overlay images upon images. The result is a dynamic and interesting abstract work. One last theme I am noting in this series is the idea of using recycled materials. The substrate the images are on are recycled papers that I have collected for more than a decade now. The recycled papers have writings and notes that connotes that idea of material collection (concepts and ideas) over time. I incorporate imagery within imagery by taking pictures of trinkets and things that are in my desk drawer and digitally printing them on the recycled papers that I have collected. Those trinkets and things are symbols of the idea of material continuum produced by consumerism. Overall, the complex overlays of imageries, the opposition of value and balance, and the the idea of material continuum creates the abstractness for the series of Convolution. This month of April, the Paolo Mejia Art Gallery and Design Studio is seeking emerging artists for its first “Small Art” group show. We are looking for art pieces up to 14″ x 14″ in any medium. Artists are encouraged to submit strong pieces that best represent who you are and what you do. For submission see guidelines below. Submit up to 10 pieces for consideration. Label such as: (ie. Artist_name_title.image). Images should not be more than 2MB. Art pieces must be NO bigger than 14″ x 14″ for consideration. Submit a small Biography (1 paragraph preferred). If you have a website/link please submit as well. Sales will be handled through the gallery. 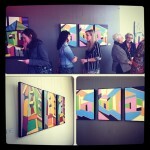 The Gallery and artist will have 50/50 for any sales of art in the gallery. 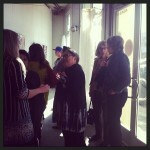 The artist reception on Sunday of February 10, 2013 at the Paolo Mejia Art Gallery and Design Studio was filled with great interest and lively motion. The reception started at two pm and did not end until half past five, the regular closing hours for the gallery, and traffic was still coming in. This was awesome! A lot of people visited from out of the city. 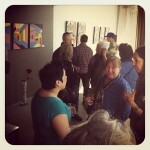 People came from the North Bay and East Bay to see Seren Moran’s art show. We were surprised to see the success of this function. 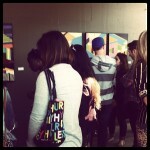 The art gallery would like to thank everyone who visited and participated in making this event a blast and a success. This visual art show would not have been a success without the interest and support of people like you to make events like this possible. To Seren and her mother, we thank you and salute you. Without Seren’s artworks there would not have been any art show, and without her mom’s support the show may not have been unexpectedly active and dynamic. Thank you to both of them, their families and friends. 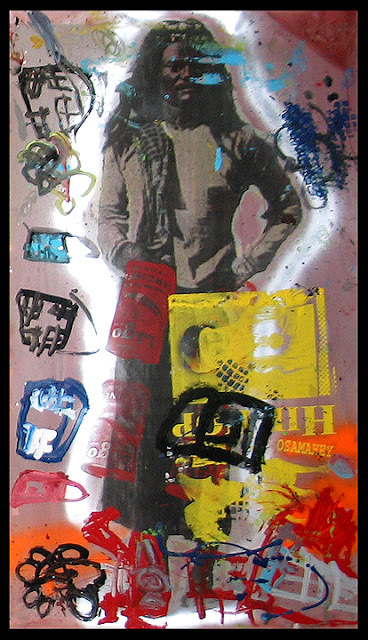 This art work is a 14 piece mixed media on wood panel (16 in actual). 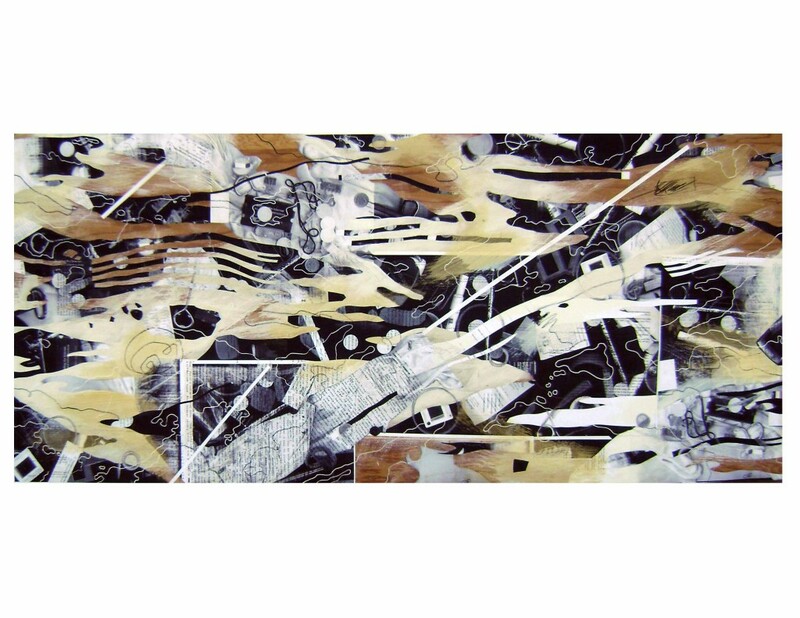 It depicts a dynamic flow of abstracted imagery jumbled up in a tsunami force-like impact. This piece also memorializes the event that took place recently in Japan. The imagery were abstracted as layers of superimposed shapes are added by arbitrary and random selection. Individual panel pieces were first cut to size and then worked on as multiple layers were added. The work evolved as all 16 pieces start to collect layer by layer. Composition was extremely important in denoting how it would look. In this picture, it was displayed in a long horizontal piece that connected individually. This piece can also be connected in a four row and column composition or a giant square, as it was originally made to be adjustable to different composition. But figuring out the right piece to go to certain position can be more complex than how it looks. Each piece connected somehow to complete another. Cartographic-like drawing designs were lastly added to give more character and complexity to the dynamic flow of the piece. 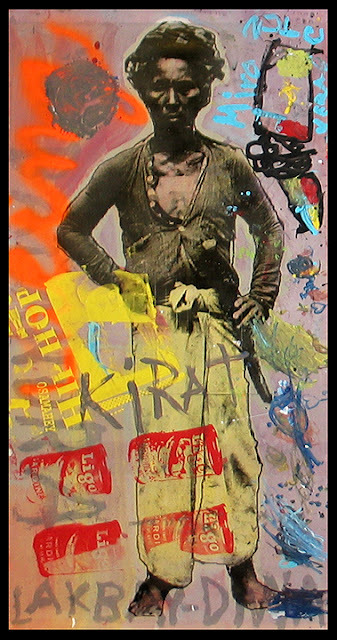 Below is the result of overlaying imagery using collage media.